Careful With That Axe, Eugene: YouTube - 50,000 views! 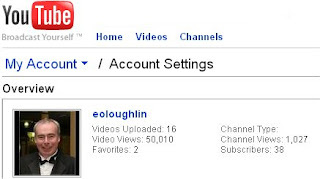 More (modest) success with my YouTube Channel as it passed the 50,000 total video views mark this afternoon. The channel itself also passed the 1,000 view mark earlier this week. These are all educational videos and it continues to astonish me that I can reach so many learners with this medium. I have about 130 students in my classes this semester - never could I hope to reach thousands of students in the classroom. I have recently started a Problem-Solving Techniques series of videos that draw upon material in my book. I don't know if this blatant self-publicity will generate any extra sales, but it is worth a try. The viewer figures are still very low for these, but hopefully they will attract a modest audience who might find them useful. Your my fu*king hero boy,im off to shoot a goat in your﻿ honour.